When we're searching for a soul mate, we look for someone that's smart, funny, caring, all that stuff. But most of all? We look for someone that's dependable. If we're going to invest our lives in a person, we have to be able to depend on them, right? Falling in love with a brand isn't all that different. Brands lure us in with witty slogans and timely discounts, but it's a brand's dependability that makes us stick around. Think about it, inbound marketing is all about content and communication that people love. And love is rooted in lots of qualities, including consistency. Customers stay loyal to brands when they feel comfortable and in sync with them -- it becomes a relationship. 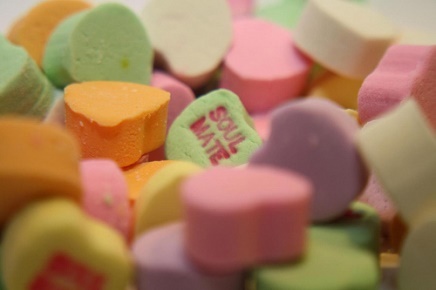 The key to being your leads' and customers’ soul mate, then, is building a brand they can count on. But how? Sure, it may seem like that's a job for the services and support team, but marketing plays a role in this too ... because what’s at the heart of consistency is your brand’s message. All of your communications and marketing assets should tell your brand’s story. These 15 businesses do an excellent job of doing just that -- keeping their brand alive, recognizable, and exactly in line with what their adoring audience expects, across all of their marketing assets. Fitness centers can be intimidating to the average person. GymIt gets it, and takes intimidation out of the equation by talking to its clientele like real people. The Boston-based gym calls itself "hassle-free" and keeps working out simple. One of the brand's slogans is "Get In, Work Out" -- clean, to-the-point, and clever. To prove that GymIt doesn't cater to protein-shake, body builder types, its marketing doesn't take itself too seriously, either. 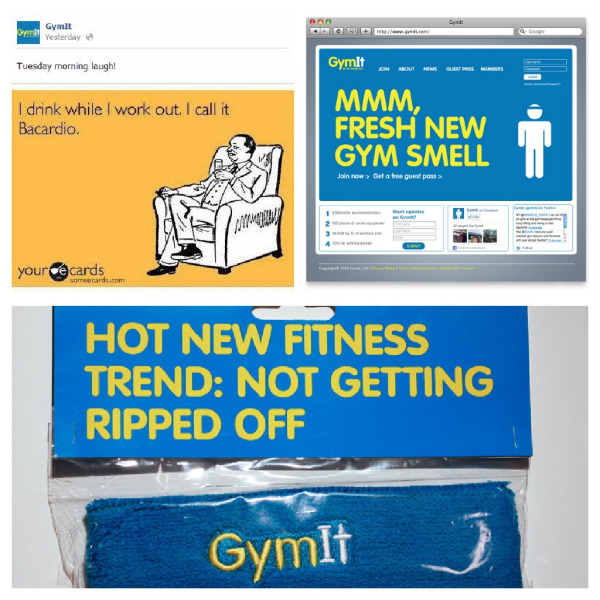 Below are some snapshots of GymIt's playful copy across social media, merchandise, and their website. The cloud-based file sharing platform, Dropbox, is great at consistent design and personalization across channels. You won’t find any Dropbox communication or platforms without their signature logo -- an open, blue box that looks like it was sketched with colored pencil -- nearby. This hand-drawn style is behind all of the brand’s designs, whether it’s a fun image on the homepage (top right) or a creative error page (top left). 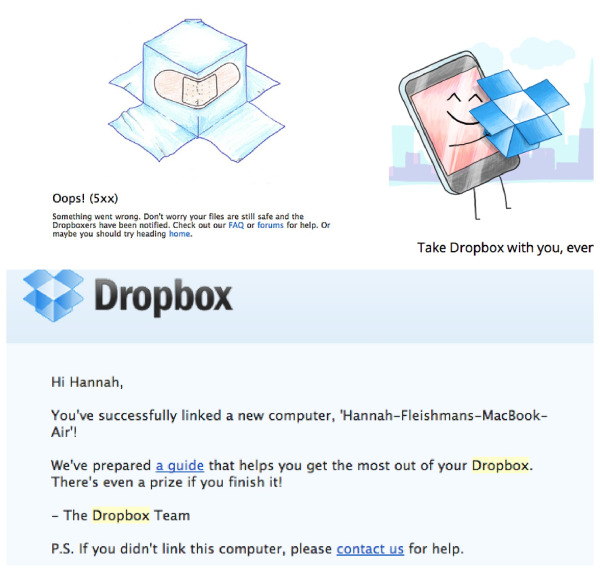 Dropbox’s email marketing aligns with that fun, personalized messaging. See the screenshot below of an email I got confirming my computer has been linked. See how they’ve lured me in with prizes if I read the guide? Well, it totally worked. This organization donates 100% of its donations to building water wells in Africa where women and children use yellow jerry cans to carry water back to their villages. charity:water's logo is a stylized jerry can (bottom left) and not only keeps the branding present across channels, but keeps the issue the charity is helping solve top of mind, as well. While many traditional nonprofits stick to old-school marketing tactics, charity:water recognizes that in order to inspire people to support a cause, you need to have inspired marketing. The organization's birthday campaign has attracted supporters like Will Smith and Justin Bieber (top left) which charity:water uses to show how nonprofits can be trendy, too. Other trendy events like the annual Charity Ball (bottom right) make this brand a leader in reinventing nonprofit marketing. Naked Pizza. Rawr ;-) But really, it's a revealing name for an honest brand. This business offers healthier pizza than the average chain by using only all-natural ingredients and a crust packed with grains and probiotics. 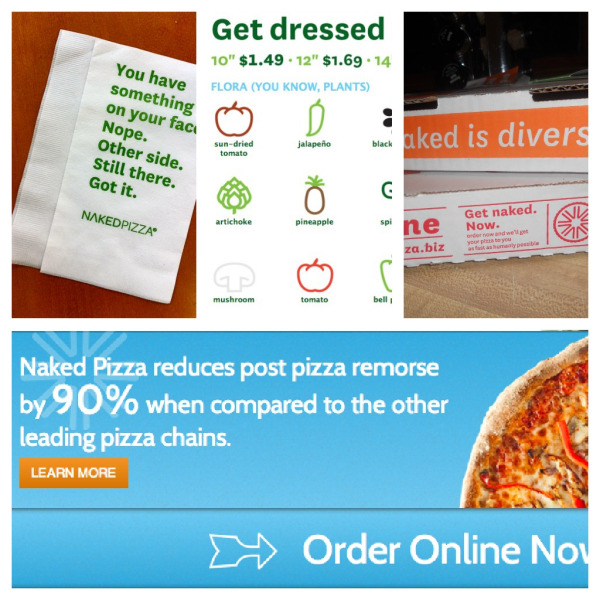 Naked Pizza's promise of all-natural is enforced by its refreshing style and tone seen across its marketing assets. Like GymIt, Naked Pizza suggests it doesn't take itself too seriously and that pizza can be guilt-free and fun. The brand is lovably sarcastic and keeps its design clean and appealing while communicating its delicious message. You don't have to use conversational tones or playful designs to be a lovable brand. 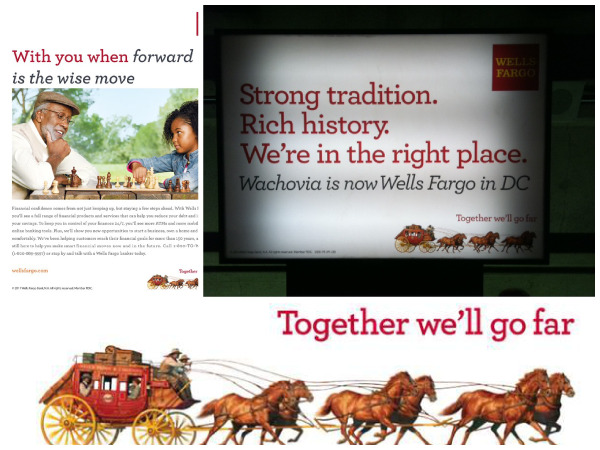 Wells Fargo, a leading bank worldwide, keeps its messaging traditional and old-school. In a good way! The brand is committed to its core values, including ethics and putting customers first, and they communicate this consistently through font, colors, layout, and keeping their logo ever-present across channels. Their slogan "Together we'll go far" inspires copy that is rooted in family and building relationships. This organization fights for a great cause with great marketing. 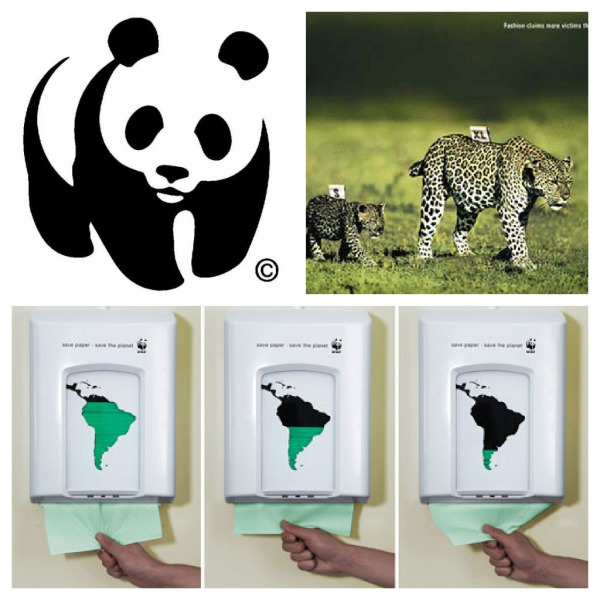 The WWF's style and imagery creates a mood across channels that forces you to reflect for a moment on how we treat our wildlife and ecosystems. Below are three examples of how the brand communicates that same strong message in creative, thought-provoking ways. Their logo, print ad, and interactive piece all have a darkness to them through suggestive messaging or tone because of how serious the issue is. 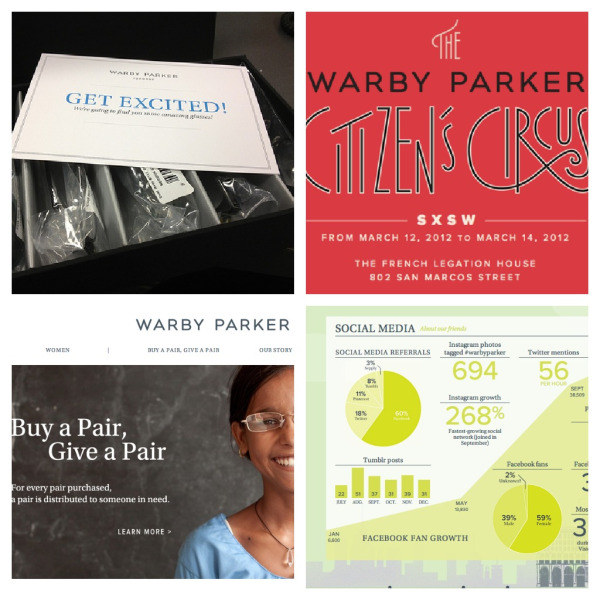 Warby Parker "creates boutique-quality, classically crafted eyewear at a revolutionary price point." The brand communicates this boutiquey vibe through all its promotions and marketing assets. For example, Warby Parker offers a luxurious touch to prospective customers by sending 5 pairs of glasses to try on for free (top left). Attention to style is also evident across channels: their website (bottom left) is clean and easy to navigate. Even their annual report (bottom right) feels "classically crafted." The brand calls its style "vintage," and their Citizen's Circus event at SXSW in 2012 was dripping with vintage touches from signage to tents. 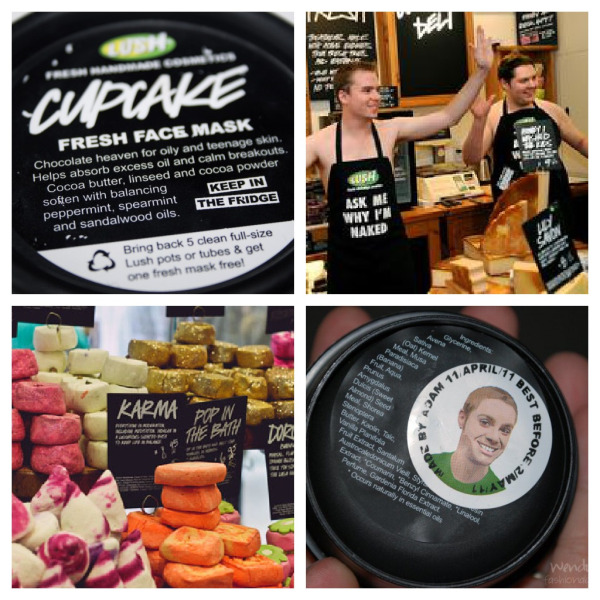 The international handmade cosmetics company, Lush, believes in "making effective products from fresh organic fruits and vegetables," and in "happy people making happy soap." Lush stores, products, packaging, and employees (top right) all tell that story. Their commitment to natural, organic ingredients is totally aligned with how they display their products (bottom left); Lush's soaps, powders, and shampoos sit in their raw form in-store until the cashier wraps the product up once it's purchased. Foregoing packaging oozes a natural vibe. Products that require packaging, like their face masks (top left), don't hide the ingredients listing and encourage customers to recycle after use. All packaging also has a sticker on it with the face and name of the employee who packed it. Every piece of marketing collateral at Lush has a personal, no-frills approach. Boston-based burrito company Boloco pays attention to consistency in detail in its online and offline marketing. The brand's slogan is 'inspired burritos' and their menus, flyers, napkins, events, website and other collateral all have a playful, hand-made touch that suggests their business is fueled by more than tortillas and guacamole. Boloco partnered with Life is Good by making a yummy Life is Good burrito with 50 cents of each purchase donated to the company's charity, Life is Good Playmakers (top right); this partnership fits with Boloco's inspired brand perfectly. 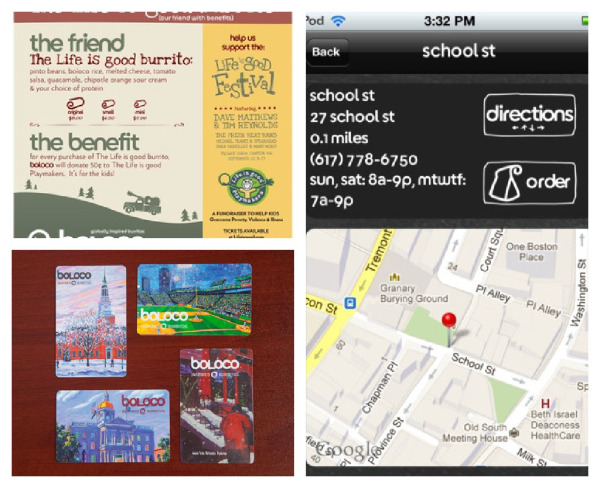 Being Boston local, Boloco keeps its marketing materials true to the region with their Boston landmark inspired gift cards (bottom left). And the company's mobile app (right), keeps branding present by using their playful signature font. No matter the marketing channel, we go loco for Boloco's consistency. Boston's Museum of Fine Arts promotes its brand throughout the city and under its own roof with such finesse in their execution, that the brand's presence is always incredibly recognizable, yet still subtle. 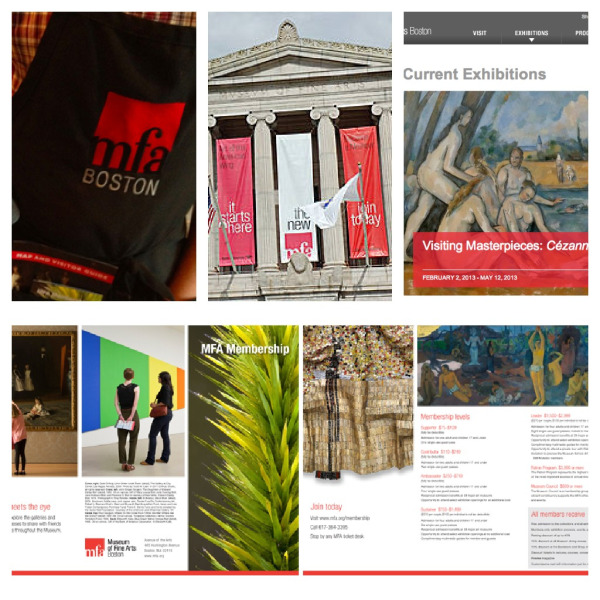 All MFA Boston marketing assets are easy to connect to the source. The brand sticks to a two or three tone color palette on all collateral, with red being the MFA's signature color. Below are examples of their use of color, as well as their consistently minimalist design on an employee's apron, outdoor banners, their website, and a brochure. With a museum full of colorful exhibitions and impressive canvases, the MFA keeps its own branding simple but strong. Intercom is a web-based customer service platform. "Treating customers with respect will always be good for business," they say. "And we believe that making customers jump through hoops to try to get help is incredibly disrespectful." Looking at Intercom’s various forms of communication and marketing tactics, it's visually apparent how much they don’t want their customers to "jump through hoops." The brand presents information in a clear, comprehensive way by using imagery instead of written explanations. After all, a picture says a thousand words. 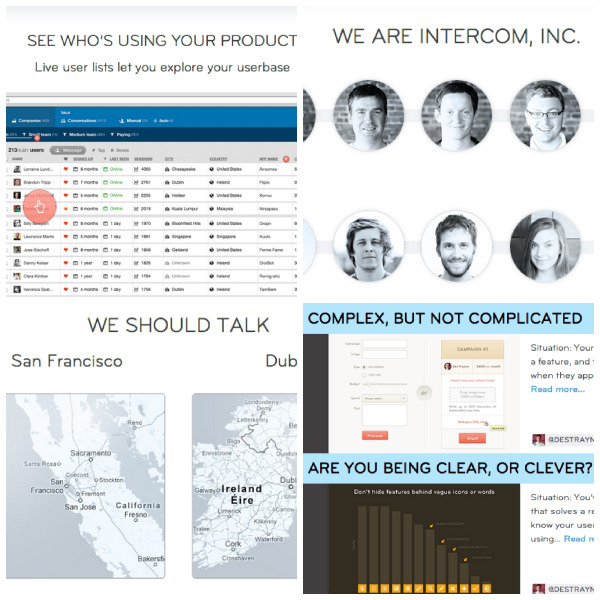 Intercom introduces its company with photos (top right), communicates its contact information with maps (bottom left), suggests the ease of the interface with screenshots (top right), and compliments blog content with valuable graphs and design (bottom right). Enticing me with visuals definitely takes hoops out of the equation. Innocent Drinks is a playful smoothie and juice brand from England that keeps its innocent reputation strong with marketing that will make you feel like a kid again. Their meta description reads: "hello, we're innocent and we're here to make it easy for people to do themselves some good (whilst making it taste nice too)." How cute is that? 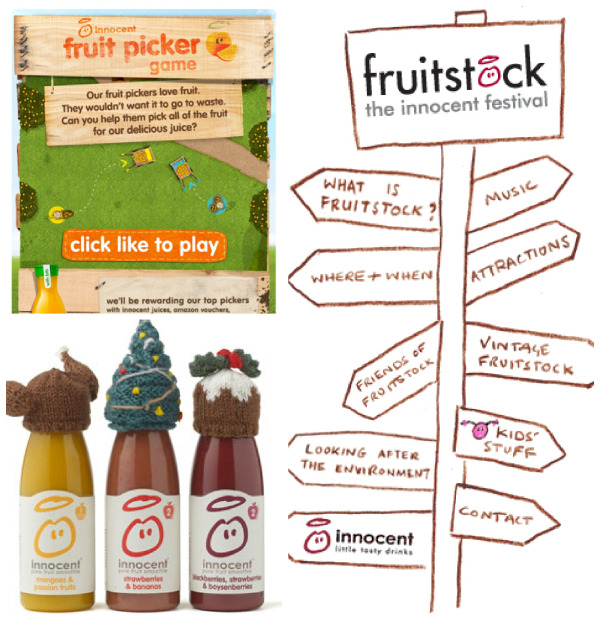 Below are examples of more lovable approaches to branding like their Facebook game (top left), product images (bottom left), and inventive website navigation for the brand's annual event, Fruitstock. Innocent Drinks stays true to its personality in its tone and creative execution. Zendesk is a cloud-based customer service software system that has built a charming brand through a funny mascot and sleek, bright design. 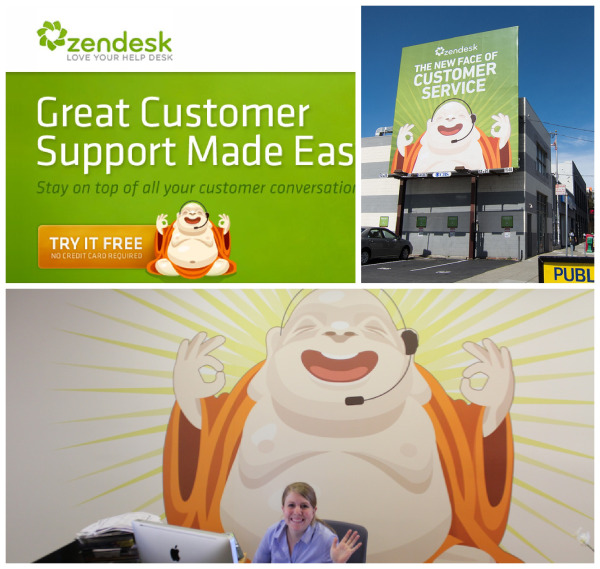 An unusually jolly buddha is the company’s friendly icon, found on marketing assets from billboards (top right) to the website (top left). Why buddha? Well, being "zen" means you're at peace, and buddhas embody that feeling. It’s important to communicate a consistent brand image to the world, but Zendesk recognizes that consistency comes from within as well. Their office has a large mural of the happy buddha on the wall (bottom) to keep the feeling strong within company walls, as well as outside. The brand’s signature green is used consistently across channels and compliments the uplifting buddha character. Sportswear brands often promise that their products will make you a better athlete, but the process and hard work it takes to get there is sometimes forgotten. Lululemon Athletica, a yoga and sportswear brand, keeps the act of working out alive across its assets. The brand hosts free yoga classes in its stores, as well as public outdoor classes. 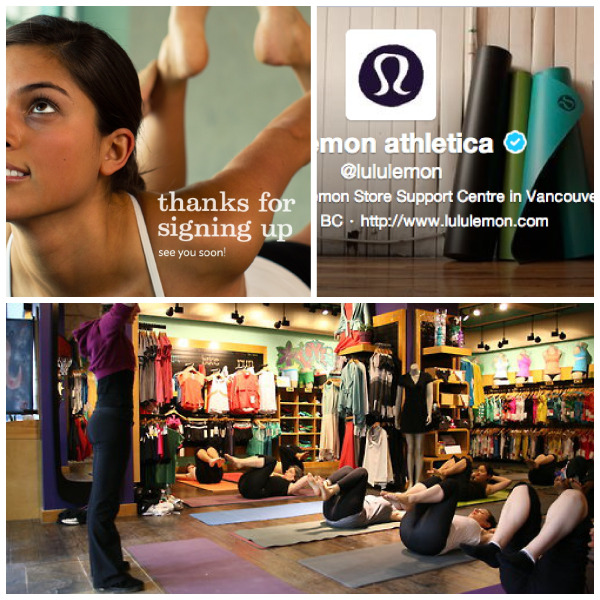 Their confirmation email (top left) for joining their mailing list is a large image of a woman doing yoga, and the brand's Twitter profile (top right) displays yoga mats waiting to be rolled out. The brand designs yoga clothing and gear, so why skip to the gratification of doing it when you can cultivate a feeling around the process? 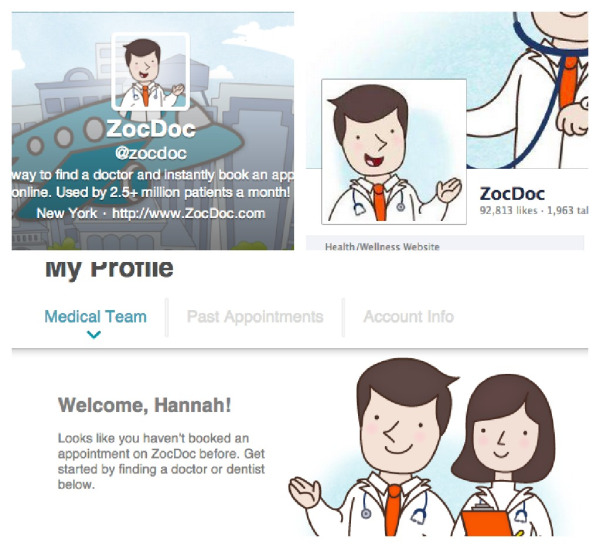 ZocDoc is an online service for finding and booking appointments with physicians in your area. The brand aims to improve access to healthcare, and they communicate the ease of their process with cartoon mascots across all their marketing communication channels. After all, cartoons make us feel like a kid again, and boy, were things easy when we were kids. See ZocDoc's charming spokesman below on Twitter, Facebook, and on the website's personal account page. Now that's soul mate material, right? A lot of these brands use playful creative and conversational tones, while others prefer more serious, thought-provoking approaches. Whatever the tone, be sure to keep it consistent across all channels to give your customers a brand they can count on. What other brands do an excellent job at maintaining consistency across their marketing assets?